KO-5 was a shore based device located at major communications centers. Initially, it was built for the US Army in the early 1950's to encrypt facsimile on point to point circuits. Later it was adapted to encrypt 16 channels of 100 WPM teletype circuits simultaneously. It was a FDX, tube type machine about 20 feet long, using magnetic core memory, pre-punched paper key tape to load the key, and Morse code communications for starting and synchronizing. KO-5 was commonly referred to as "The Horse" by US Navy personnel. The complete terminal consists of three KG-7 Key Generators and a H~5 Control Console. Two KG-7s are utilized for transmitting (ie one for Key and another for Check Key) while one KG-7 is utilized for receiving. 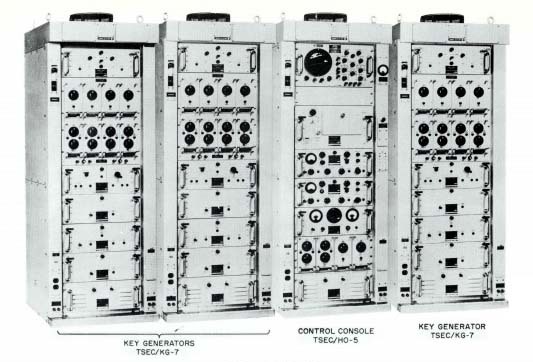 It's 16 teletype channels were multiplexed with the aid of an FGC-60 tone converter. For more detailed info on the KO-5, please select this link.